What a lovely sunny weekend, even up here in the Frozen North! Now Mini Minx is 2, I’m no longer a sunblock Nazi, covering every square centimetre of minx skin in thick white gloop. We get so little sun that I’m more worried about Vitamin D deficiency than sunburn. But our handy wee UV monitor said it was level 5 before 11am, so out came the sunscreen. You can tell we’re multi-parents – we now buy it in trigger guns so we can chase after rapidly escaping naked minxes and spray them head to foot, like in a spray paint station. 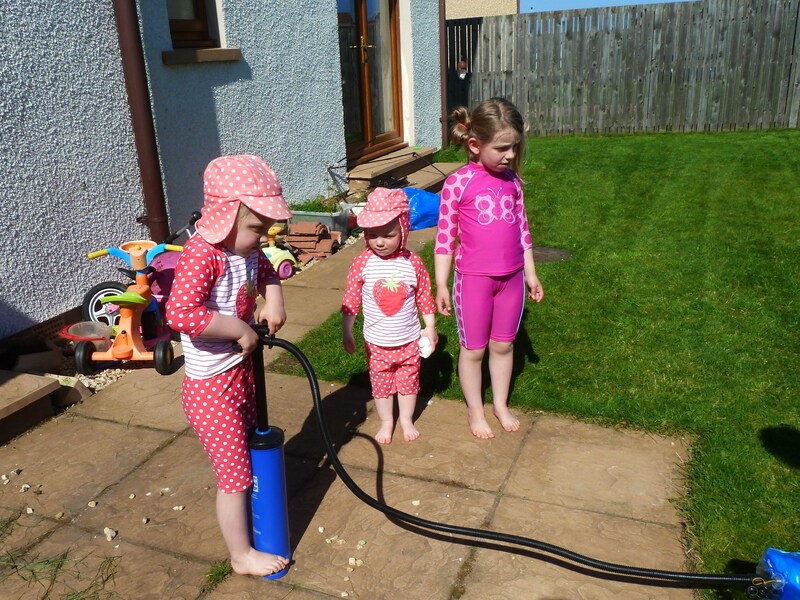 And luckily their UV sunsuits still fitted, so it made for a lot less minx to plaster. And boy, did they need it – The Boss is now known as Daddy The Loser after burning his back and baldy head with an hour in the sun, constructing a cat-proof cage for our seedling vegetables. You’d have thought he’d have learnt after I went a delicate salmon shade of pink a few weekends ago. Or maybe it was karma from his gleefully braying ‘Loser!’ at me too often? (Remember ‘loser’ is our codeword for sunburn victim). I think the girls lasted nearly 2 hours before they needed more calories – crisps and hot chocolate milk, to give them some salt and some heat. Drinking hot chocolate after a splash in the sun, wow, it felt like being on summer holiday! Screams of joy (Mini doesn’t get to paddle very often) mingled with screams of glee (Midi catching Maxi square in the face with a bucket of grassy water) and screams of anger (Maxi). 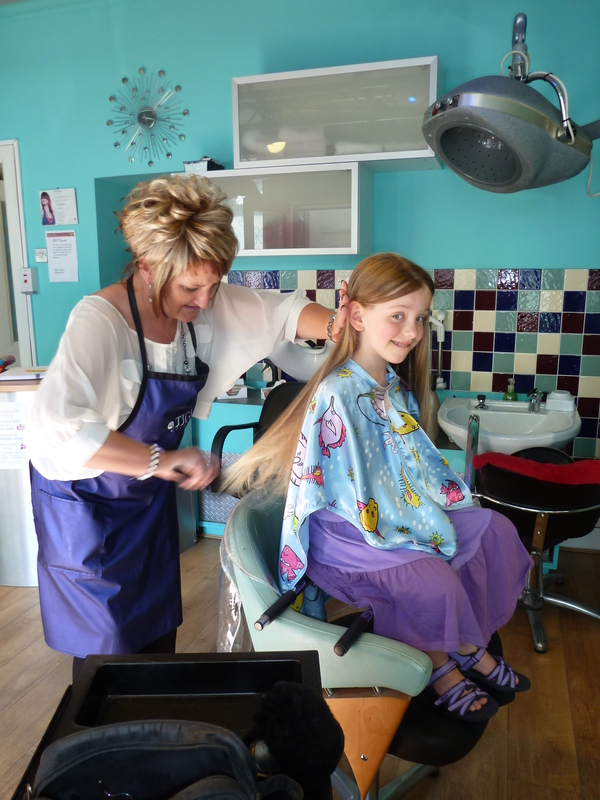 Rapunzel, Rapunzel: it’s scissors or hairbrush, young lady – you choose! Anyway, I had to haul Maxi out from queening it over her sisters in ‘her’ paddling pool for her biggest treat of the weekend: her first ever haircut. Yes – EVER. She’s now 6 and her thick, golden hair goes down her back, past her bum, and a few inches past. Just like every mother of a long-haired daughter, I got fed up threatening: “Scissors or hairbrush? !” every morning, as Maxi complained about the pain of getting rid of the tugs. So after I got more purple hairdye applied, my hairdresser made a fuss of Maxi and cut her hair to about elbow-length. Like a silly, overly-proud mummy, I took photos to mark the event and kept a 6-inch long lock of her baby-blonde hair tips. All 3 staff at the salon made a big deal of my little girl and she thoroughly enjoyed every minute. Talking of loonies, I think the sun’s gone to a few people’s heads. In Elgin today I watched one wee boy on a powerful motorbike, dressed in jeans and a tee-shirt, with his anorexic girlfriend clinging on to him, dressed in camisole and knickers (well, they were too short to be shorts, surely?!). They were both wearing helmets, but if they came off at the speed he was riding at, they’d become mere smears in the road. Maybe the helmets were there to keep their teeth within a small area, to aid dental record identification? Ahhhhh, must have been aircrew! 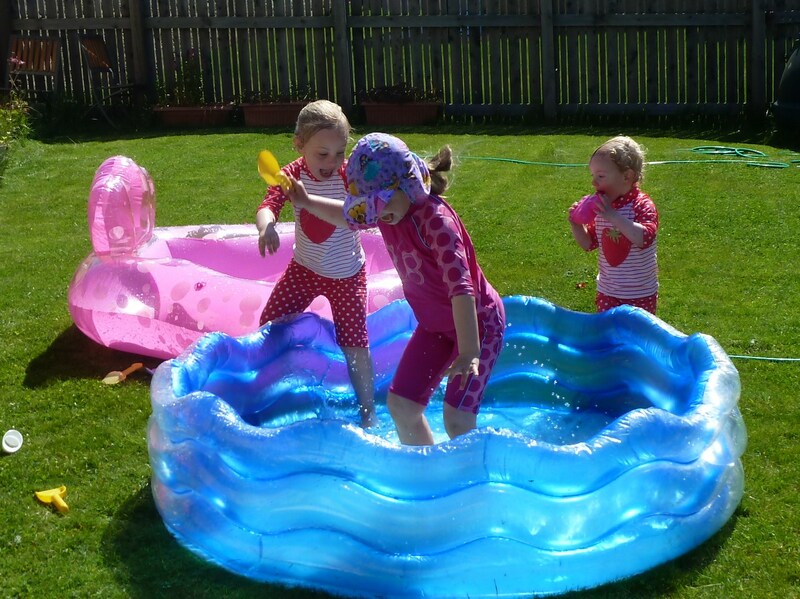 This entry was posted in baby milestone, gardening, Out and About and tagged children, first haircut, paddling pool, sunburn by GrumpyOldTrout. Bookmark the permalink.